Amazon is going to bring Echo Link to India sometime during April and it may be priced at Rs 15,000. According to a report by MySmartPrice, Amazon is gearing up to launch the Echo Link in India as early as the first week of April. The Echo Link offers hi-fi music streaming to stereo systems and also acts as a peripheral to Amazon Echo device. It offers multiple audio inputs and outputs including analog RCA subwoofer RCA, coaxial, optical, 3.5mm jack and RJ45 Ethernet port. It has a volume control knob on the front but doesn't have a microphone and does not support casting via Bluetooth. 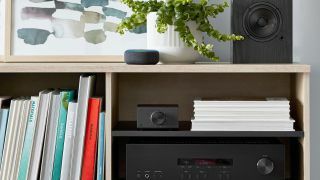 On the other hand, the Echo Link Amp brings in a 2 channel, 60W digital amplifier to the table giving users the ability to connect their Echo devices to stereo speakers for hi-fi audio playback. The Echo Link measures 4.5 x 5.3 x 2.7 inches while the Echo Link Amp is larger at 8.5 x 9.5 x 3.4 inches as it comes with a built-in amplifier. While the report states that there are bleak chances of the Echo Link Amp to arrive in India soon, it is expected to be priced upwards of Rs 20,000. In addition to this, the two products cannot function without an Echo device which is an extra cost.